I come from the cheese country, Holland and I love its cheeses. However I have started to be critical in regard to their taste. Is it because cheeses produced on a large scale loose some of their taste? Or am I now accustomed to more natural products so when I eat a pre-sealed Dutch cheese, I only taste plastic? I stopped buying imported Dutch cheese here on Lesvos because the Gouda (as far as I know the most known Dutch cheese abroad) has no taste at all. 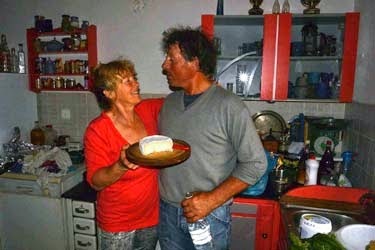 Lesvos is also known for its cheeses. That is very evident; in fact, the island has more sheep and goats than people living here. No matter which landscape you take a walk in, you will always hear the tinkling of goat's or sheep's bells. Dutch black & white spotted cows are world famous, but the sight of such a cow in a bright green meadow belongs to the past because cows in Holland are now stabled all year round. And what do those milk producers eat there? Greeks wouldn’t think of keeping their sheep and goats in a shed. These animals belong in the mountains and on the grasslands. Greece nearly has as many breeds of sheep and goats as it has islands: and due to their isolation, over time, many different varieties have developed. On Lesvos there is the Mytilini Goat (black, sometimes dark grey or black & white, with long horns and very small ears), the Black Lesvos Sheep from Agia Paraskevi (and yes, there are also white Black Lesvos Sheep) and the Lesvos Island Sheep, also called Mytilini sheep (how original). Probably descended from an eastern breed, some 80 to 100,000 of them still roam the island. These grass devouring four footers can be seen as lawn mowers, when herded well. The European subsidy has caused the number of goats and sheep to increase, and unfortunately some of their owners – who only want quick money – do not care sufficiently about the land, so that big parts of nature have become overgrazed and become barren. I'll leave this subject for another time (during the crisis it seems that the number of goats and sheep has actually decreased). It is a fact that milk producing sheep and goat in Greece are far better fed than Dutch cows. In Greece they even pay attention to what the animals eat; for instance not all regions producing feta are allowed officially to call their product feta: for feta (as well as other Greek cheeses) you must farm in a region where the sheep and goats receive a rich variety of fodder. Not all regions in Greece are graced with fatty greenery. But Lesvos has a very green nature and therefore is on the official list of Greek feta producers (the other regions are on the mainland: West-Thrace, Macedonia, Epirus, Thessaly, Central Greece and the Peloponnesos). Lesvos not only produces plenty of feta, but also the hard cheese graviera, ladotiri, which is stored in olive oil (also called kefalaki and one of the licensed cheeses of Lesvos) and the fresh, soft cheese myzithra. In contrast to the Dutch cheese which is made with cow milk, cheeses on Lesvos are mostly made with a mixture of goat and sheep milk. I have to admit that I find Greek cheeses often a bit too dry, but just like nearly all Greeks who do not eat a meal without cheese, I love dishes with prepared cheese, like ladotiri saganaki (baked ladotiri) or feta kafteri (feta mixed with chillies and/or garlic cooked in the oven, a nice spicy dish). And you have the homemade fresh feta, which can be so delicious that I cannot stop eating it, especially with a lick of honey on top. I have been told that making your own feta is not so difficult. But you need space to curdle the milk, to strain it and so on, and everything with the right temperatures. I do not have that much space in the house, so I have never started the adventure of making my own cheese. But I do love to experiment with Greek cheeses, like making a kind of mousse by mixing feta with cream, yoghurt or Philadelphia cheese, then adding green herbs or horseradish. Other Lesvorian cheeses can also be easily mixed together or with other dairy products so that the hard goat-taste can be softened. But I do continue to miss the French and Belgium cheeses. Blue cheese, brie and camembert, a chèvre, along with the many other cheeses they produce in those countries. As they produce so much sheep and goat milk here, I sometimes wonder why there is not a bigger choice (there is a large variety of Greek cheeses, but – just like the goat and sheep breeds - do not differ very much from each other). I am not the only one wondering about that, because people have now started to experiment: feta with herbs or nuts for example. The most different cheese on the island was presented to me at Easter: a real Levorian camembert. So it is possible to produce different cheeses here! You only have to find and import the special rennet (in the case of camembert, that is Penicillium camemberti), and hoppa! : a goat camembert (The French camembert is made with cow's milk. It seems there blows a fresh wind through Greece: forced by the crisis new initiatives are taken. Let’s hope that the government not only allows rich and big developers to make quick money but also encourages small people to dare to start innovative businesses so that in a few years we not only order the world famous feta cheese in a restaurant, but also an Eftaloumberti (the first sheep/goat camembert on Lesvos was produced close to Eftalou at Dio Petres).